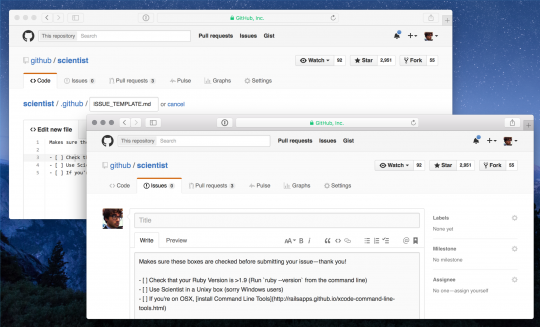 Github just recently answered to the request on improving the “Issue” (ticket, bug tracker of repository) and the “Pull request” by providing template to your github repository. The feature will allow the source code (repository) maintainers to manage how they will receive the issue or the pull request, the developer/reporter will need to confirm different steps before they can report issue or pull request. Issue templates can now be created by adding a file called ISSUE_TEMPLATE.md to the root directory. Pull request templates follow the same file-naming pattern (PULL_REQUEST_TEMPLATE.md).